How creative is this? 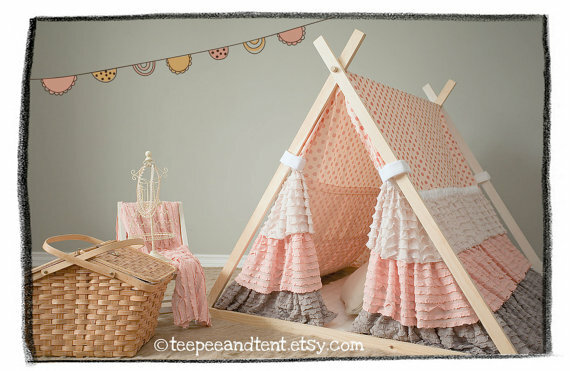 Not your average teepee here, this one from Tepee and Tent is quite the girly number! Layers of peach, pale pink, and almond colored ruffles form the sides of this lush tent, which has the sweetest peach polka dot fabric on the top half. Perfect for playtime or some really fun photography sessions! This all-girls tent made by Bubbaloubands in Ontario, Canada measures just under 4 feet wide and long and measures approximately 36 inches from the ground to the inside peak. It is perfectly sized for children under 6 and can typically accommodate between 2-3 children. Tents are available for both boys and girls. It is of course very portable and quickly sets up indoors, or can be taken outside for even more make-believe fun! 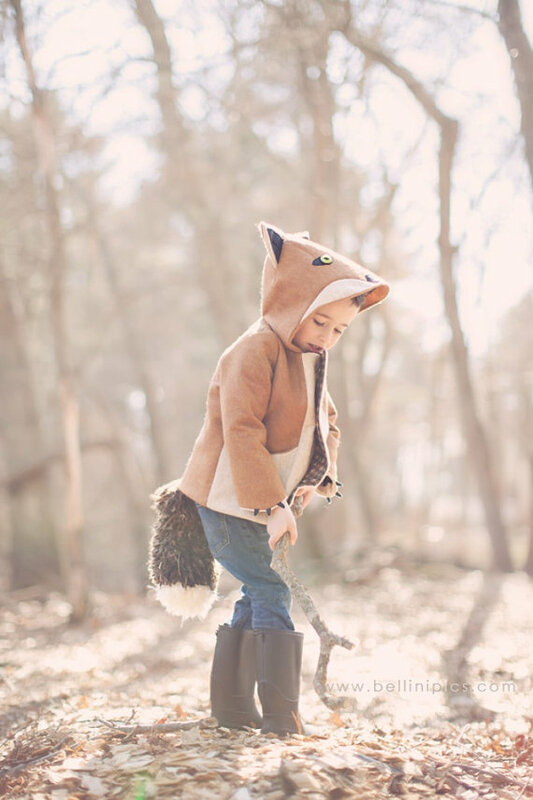 I just love, love, love the childrens’ coats made by Little Goodall in McKinney, Texas! This little fox coat has always been a favorite. I mean, what child would not want to slip on one of these precious coats and take a walk in the wild woods! And check out that fluffy tail! This coat is made of eco-felt, made from 100% post-consumer plastic bottles. This Little Goodall original design features foxy “claws”, a fox face hood, two slip pockets for warming foxy paws, and a fuzzy yarn fox tail. The interior of this beautiful coat is fully lined with a fun cotton print and closes down the front with three vintage buttons. Sleeves are lined with brown poly lining fabric to slip easily on and off over clothing. The coats are designed by Molly, who holds a BFA in Fashion Design, and is a featured Etsy seller. All coats are custom made in different sizes for both boys and girls, and are dry clean only. Take a look at this pirate card table playhouse by Etsy seller Miss Pretty Pretty! Julie in Wisconsin makes these in custom sizes to accommodate different table sizes; instantly turns any card table into an imaginative playhouse. They are all completely handmade from wrinkle free eco-felt and are designed to be heirloom toys. All items used in these playhouses and toys are certified completely child safe for all ages. No small parts, no paint, no glue or vinyl! The felt used in these playhouses is produced from 100% post consumer plastic bottles, manufactured in the USA. Each unique playhouse is created, drawn, traced and lovingly cut by hand. There are no pre-made die cuts and no store bought appliques, which in our fast-paced world is simply amazing! Recently the “Little Red Playhouse” was featured on a “Cool Stuff for Kids” segment on the Today Show. If you like, there is also an option to make your own version of these award winning card table playhouses by purchasing the Card Table Playhouse Pattern. This pattern will teach you how to make the popular Little Red Playhouse that was seen on the Today Show, and Julie even promises to help you every step of the way through emails or Etsy conversations. She’s making me think again about offering my own patterns up for those who like to create at home. If you use Facebook, you can “like” her Facebook fan page to receive all of her shop announcements and fun postings of great projects and activities that inspire imaginations in young children and families at www.facebook.com/MyFirstPlayhouse. This entry was posted in Etsy and tagged card table playhouse, child's coat, creative, Etsy, Etsy Friday, fox coat, imagination, Little Goodall, Miss Pretty Pretty, play, playhouse, tent, tepee, Tepee and Tent. Bookmark the permalink.